One of about 50 endangered animals whose habitat includes Virginia just got a new lease on life. 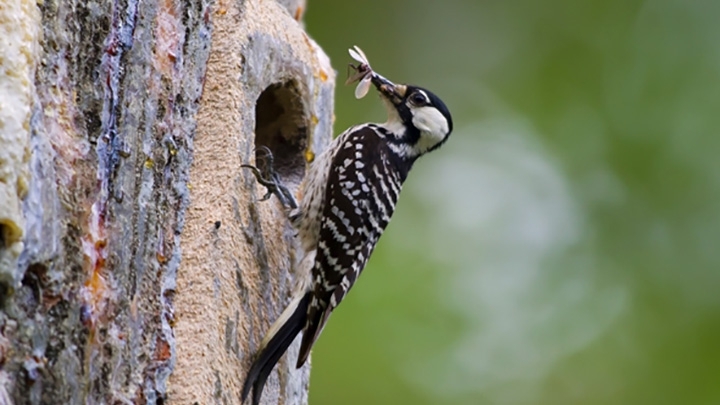 Late in June, the Center for Conservation Biology (CCB), a joint program of the College of William and Mary and Virginia Commonwealth University, announced the first successful breeding of the red-cockaded woodpecker in the Great Dismal Swamp National Wildlife Refuge. The Great Dismal Swamp meanders through southeastern Virginia and northeastern North Carolina, between Norfolk and Elizabeth City, N.C.
CCB Director Brian Watts said in a news release that the Great Dismal Swamp breeding program is “a milestone in an ongoing effort to establish a breeding population within the refuge.” Conservationists were concerned because of the risks of having a habitat in an area prone to hurricanes and other natural disasters, so the breeding program in the Great Dismal Swamp was started in 2015. At first the effort seemed like a long shot. “During the run up to the breeding season, only five of the 18 birds that had been moved from other populations remained within the refuge, including two males and three females,” Dr. Watts said. “By early May, the birds had formed two breeding pairs and soon each had laid three eggs.” The eggs hatched on May 13. Twenty days later, the young birds were “flying and foraging,” Watts reported. Near-extinct species that have habitats in Virginia include such creatures as the bog turtle, the smallest turtle in North America, and the Shenandoah salamander found only in the Shenandoah National Park. Another example of a Virginia endangered species is the spruce-fir moss spider, one of the smallest tarantulas. It lives in the highest peaks of the Appalachian Mountains. For more information on the series and dates and times, visit ideastations.org/rare.